Procrastinate. Yep. That’s the winning strategy. If you never do anything then you can talk yourself into believing that you never actually failed. Failed to do anything sure. But you never tried something and then failed and that is an important distinction. That is the space I am in at the moment. It is almost like paralysis. I know there is stuff I can do. I know there are things I should do. There are things that I would like to do. Instead I signed up for a service that tells me everything I need to know about my Twitter followers. Fascinating stuff. It apparently allows me to go after the followers of the people who follow me and to unfollow the people I follow who don’t follow back. It has been especially useful in identifying the guy who followed me today (who led me to the service) and then after I followed him, unfollowed me! Clearly it was time well spent and it justifies not doing the things I should have done. But all that activity falls into the category of stuff that I know I can do. Easily. None of it fell into the category of stuff that I should have done today, the stuff that I had planned to do. I know why. It isn’t easy. I am doubting that I can do it well and I don’t like to think of myself as a failure. So I don’t. I don’t do it and then I can’t fail at it. And I seem to do that more than I want to admit (not a surprise I suppose if you think about it). I have done a bit of cleaning up lately and finding a large number of things I have started. Not finished. Prototyped. Trialled. Completed the proof of concept. Determined as something I could do. And then left to be forgotten. 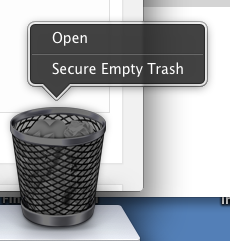 Not in a “I can’t remember where I left my keys last night…” kind of way but in a deliberate “Delete” & “Secure Empty Trash” kind of way. That is one thing I am good at and I know why. The pain of a missed future opportunity is easier to bear than the pain of a future failure so I choose the missed opportunity. Tomkins would describe it as avoidance of anticipatory shame. I anticipate the possibility that failure in the future could be such a large a blow to my ego, my sense of self-worth, that I procrastinate to avoid it ever happening. I find other things to do and eventually something else pops up that is interesting enough to seem to call for a prototype (or easy enough that I know I cannot fail) so that I am able to forget the thing that I am afraid to do. Then all I have to do is deal with the shame around the missed opportun… a blog post! That is what I will do, write a post about procrastination. Missed opportunity deleted and waiting for me to empty the trash in a few days time! So yes I am aware of the irony surrounding my writing this post. It is something I can do. But it also feels a bit like confessing my sins will help me to find a way to be better at being ok with failure. I think that will be my resolution for tomorrow. To fail more often. To get practice at trying, at making the journey all the way until it ends. Terrifying.